The Quote-to-Cash process is a critical time within your sales cycle. It’s also complicated; between pricing and quoting to contract creation and negotiation, there are a lot of moving parts. That’s where a solution such as Salesforce CPQ can help, especially when coupled with the right tools. Once you’ve started working with Salesforce CPQ, you can accelerate your deals even further with direct mail and gifting touchpoints. For example, Sendoso, a completely integrated solution, allows you to send your prospects anything from right within Salesforce. And we’re not just talking about postcards. Think personalized gifts, swag, plants, sweet treats, wine, and even handwritten notes. Sendoso’s integration even allows you to map Sendoso sends back to Salesforce campaigns so you can measure success. Contract negotiations can take weeks (if not months), and sales reps need to maintain strong relationships during that time. Here are three different ways direct mail can help strengthen connections and accelerate deals in tandem with CPQ. Salesforce CPQ enables you to create brand-approved proposals and contracts with just a click (including the right collateral and eSignature integrations), giving you more bandwidth to nurture the relationship and close the deal. Research shows that even a small gift can dramatically affect the success of sales negotiations. Consider sending a $15–20 lunch eGift card to each person you need a signature from after the proposal goes out. Include a thoughtful message, such as “Excited to start working with your team! Have lunch on me today.” Or, if your contract conversations have gone cold, send over a sweet treat (such as cupcakes or cookies) that the entire buying committee can enjoy together. CPQ can also play a critical role when it comes to retention, helping your team save time by automatically generating renewal quotes while applying the correct price increases. But getting that renewal (and potentially expanding the account) means having an excellent relationship. There is a high correlation between renewals/upsells and a gift touchpoint within the first few months of closing a deal. Consider sending new customers a “Welcome Kit” box with fun swag and items that they can actually use (like pens and notebooks). Then, send a more personalized gift two to three months before renewal. For example, if you know your customer is crazy about pugs, consider sending a fun pug-related gift like this (which you can do with Sendoso’s Amazon integration). As with every piece of new technology, getting the most out of this requires adoption from your entire sales team. Salesforce CPQ can’t accelerate your quote-to-cash process if no one is using it! Direct mail and gifting can help here, too. Develop “adoption KPIs” so that you can measure which reps are actually using the software. Create a contest around who can reach adoption first and offer a $50–100 experience eGift via Sendoso, which can be redeemed at a number of places: Amazon, AMC Theaters, Bass Pro Shops, and more. Alternatively, you could offer a reward to each rep who reaches adoption within the first 30 days of implementation, such as a $10–20 eGift card of their choice. 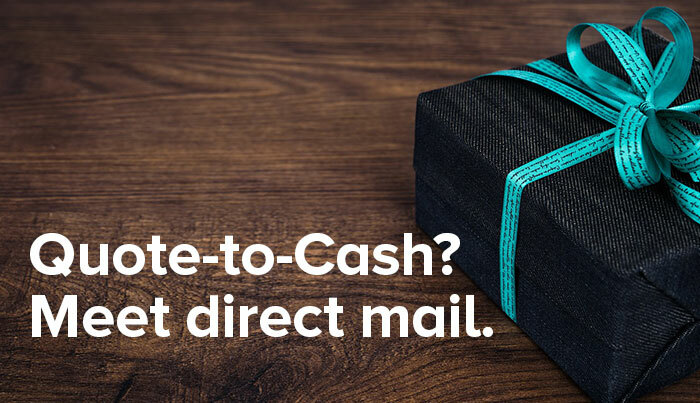 Direct mail and gifting are vastly underused in the Quote-to-Cash process, which creates a phenomenal opportunity for you and your reps to stand out. So augment your Quote-to-Cash process with Salesforce CPQ, a verified implementation partner, and thoughtful direct mail touchpoints. Remember to think outside the box! A decision maker can only get so many branded pairs of sunglasses before they all end up in the trash. Get inspired by grabbing a free copy of “101 Corporate Gift Ideas” here.